Low weight is, of course, important, but without considering how the tent will be used, its weight is not the most useful metric. It seems that more and more, outdoor consumers have become obsessed with the weight of their gear. This is especially true for tents, where the weight of a tent is the first thing people look at, and it is often how they make their buying decisions. To me – and to us at Hilleberg – this focus on weight alone is not the best way to evaluate a tent. Low weight is, of course, important, but without considering how the tent will be used, its weight is not the most useful metric. The right tent for someone on a polar expedition is very different than one for someone who is bicycling around-the-world, or someone who does weekend backpacking trips during the summer. For both the polar traveler and the cyclist, durability and strength are of greater concern than the lowest weight, while the summer backpacker is likely to prioritize weight over absolute strength. As with most things, the more of one quality you want in a tent, the more you have to give up other qualities. The lighter the tent, the lighter the materials, which translates to less strength. And the lighter the tent, the less features it will have and so, consequently, the less comfort it will offer – and possibly the less security it will give you in adverse conditions. If you need maximum strength for your adventures, then you need it, and weight should become less of a priority. Since the founding of our company, we have never tried to build the lightest weight tents; rather, we have tried to create the strongest tents at the lowest weight for their usage, and we have tried to use materials that are the best suited for the job. That way, the person who needs superior strength for, say, polar travel or winter mountaineering – or round the world cycling – can still find a tent that is, for that use, quite low in weight – with no compromise in the more important quality of strength. Similarly, the summer backpacker can find a tent that is quite light, but is still easily strong enough to handle a nasty storm. When we design a tent, we wrestle with getting the balance of our essential performance qualities – reliability, adaptability, ease of use, durability, comfort and low weight – the way we want them. Every one of our tents must have some level of all these qualities, guided by the kind of usage the tent is designed for. The process of creating our Enan one-person tent in our Yellow Label line was – and is fairly typical of how we create new tents. With the Enan, we wanted to make it as light as possible while still being fully strong enough to handle 3-season bad weather. We used our Akto design as the starting point, since it has proven itself both strong and light for all–season use for 20 years. We experimented with both inner and outer tent fabrics, eventually choosing lighter fabrics for both. We also explored using smaller diameter poles. We chose, however, to use the same 9 mm pole found in our Akto. While a smaller pole did indeed save a few grams, the loss in strength, as tested in our wind machine, was drastic – and unacceptable to us. Once design and materials were decided, we created a series of prototypes to use for field testing. Testers logged over 145 nights in trips in Sweden, the US, and central Asia, and in weather from warm and breezy to near freezing with high winds. We then reevaluated all our design and material decisions, and made some changes, based on what we learned from testing. In the end, after nearly two years in development, we are quite happy with the result: a solo tent that weighs a very light 1.2 kg/2 lbs 10 oz, and yet is remarkably robust for 3-season use. Throughout the years, we have always worked with this sort of balancing act between strength and light weight. We are always thinking about how we can improve the balance for any given model, and we often make changes to existing models to keep refining them. For me, this has been one of the most fun challenges in designing tents. The basic rule for boats is to always anchor for a storm. This wisdom also applies to tents, especially in exposed terrain. Few people purposely take their tents out in stormy conditions. Certainly polar expeditions and high mountain climbers expect to encounter bad weather, but most people (very smartly) try and avoid storms during their time in the mountains. Some people I’ve talked to don’t think much about how to handle bad weather, and others don’t really know how. But storms do happen, and even those who plan their trips carefully around the weather will, at some point, encounter challenging conditions. A “storm,” of course, can mean anything from a wet, rainy night to a days-long blizzard that forces you to stay in your tent. Most times, the bad weather conditions I have seen are more like the first, but I have also been out with my tent in very stormy conditions, and I have seen large wood piles literally scattered by winter storms. I’m often surprised at how many people don’t anchor their tents as a matter of habit. The basic rule for boats is to always anchor for a storm. This wisdom also applies to tents, especially in exposed terrain. Of course, having a nicely and tautly pitched tent to start with is key. But in addition, I nearly always peg down the perimeter of the tent and put out all the guy lines, even on a beautiful summer day, since, if the weather does turn nasty, it always happens in the middle of the night! Using the guy lines certainly provides extra stability, but they can also make for a quieter sleeping experience, even in very light winds. On tunnel tents, it’s important the guy lines are tight but not to the point where they pull too hard and flatten the top of tent; this can actually weaken the tent’s structure. Something that many people forget when thinking about dealing with bad weather is the choice of camping spot. While seldom considered a part of anchoring for storm, if you choose your site based on the views – the top of a peak, or on a ridge, for instance – you are much more likely to take the brunt of any bad weather that comes your way. Instead, choose your site with an eye to keeping you safe from the storm, then hike for the photo op! I know that some people don’t anchor their tent because the conditions are tricky, but a little imagination goes a long way. If the pegs that come with your tent don’t work, you can use heavy rocks and some guy line, or make deadman anchors from trekking poles, canoe paddles, or even branches. In the winter, our Snow Pegs are excellent, since they can be used both vertically, like a “normal” peg, and deadman-style. “Snow anchors,” stuff bags filled with snow and buried, will also work, and some mountaineers use pickets. Those doing trips in the Polar regions often use ice screws. A good friend of ours, a professional hunting guide, uses Stinger Titanium pegs for anchoring in the frozen tundra of Kyrgyzstan. He says they are perfect for those conditions, since you can pound them in and then, when they’re frozen in, you can pound on them to loosen them. And, of course, in deeper snow, in addition to our Snow Pegs, you can use skis and ski poles, or snowshoes. I use skis two different ways. The first, and easiest, is as a giant peg, so using the same placement logic as regular pegs: put the ski into the snow, tail first, at a 45° angle to the surface with the edges up (otherwise, the guy lines can be cut). I also use skis as a deadman. This is a great way to anchor two of the guy lines on one side of a tunnel tent, like our Keron or Nammatj models, at the same time. Regardless of the weather or the terrain, it’s always wise to be prepared for changing weather, no matter what tent you’re using. Even fully free standing tents like our Staika, Allak and Unna need anchoring. I have seen free standing tents get blown around when someone forgot to anchor them, then left them unattended! To arrive in a remote wilderness spot, pitch a tent, and cook and eat a meal while surrounded by the simple beauty of nature – that is one of life’s greatest pleasures. I have always loved being outdoors. When I was growing up, there was a forest behind our house, and I spent as much time as I could in it. Autumn and winter weather fascinated me, and I would sit in “my” forest and listen to the wind for hours. One of my chores was to get milk from the farm next door, and in the fall and winter – when darkness comes very early to Sweden – I had to use a lamp to see. When the foxes howled and the deer cried in the night, I felt like I was deep in the wilderness – and I loved it. All through my childhood, I read about explorers and others who lived their lives outdoors, so it seemed only natural to me that I train to become a forester. For my military service, I went to the mountain hunters unit in Kiruna, many miles above the Arctic Circle. This training offered a real outdoor education, since each man had to carry his gear, cook for himself, and be able to survive in the mountains in all weather conditions. Here I learned how to take care of myself in the wilderness, and I fully developed my love of getting out, seeing new places, making camp, living the camp life – a love that has never changed. Every time I go out into the backcountry, I get the same child-like excitement about its newness and its possibilities. To arrive in a remote wilderness spot, pitch a tent, and cook and eat a meal while surrounded by the simple beauty of nature – that is one of life’s greatest pleasures. I began work as a forester, but I kept going into the mountains as often as possible. I led trips, and worked with educational groups and clubs – something I have continued to do since then. After a few years of forestry, I felt more like a sort of “forest engineer” – and today, foresters are called “forest engineers” – than someone working with nature. In 1971 I had started my own company, Hilleberg AB, selling forestry equipment and doing some small-forest management, but I began turning to what I knew and loved – the outdoor life – and began making tents. My first tent was, frankly, a huge flop. I had been frustrated with tents where I had to pitch the inner first, and then the outer, especially in windy, rainy conditions – conditions that are, unfortunately, quite common in the Swedish mountains. The tents I had in mind I wanted to be able to pitch in one step, which meant that, somehow, the inner and outer tents had to be connected. Renate and I were married in 1972, and after that we worked together on the new tents. We tried using a foam-backed material, which, in theory, would not only keep water out, but would also (because of the foam) reduce condensation. We found that the theory about reduced condensation lasted for a few days of use, but after that, it got too wet, and since it is always hard to find drying opportunities when you’re out, everything ended up wet, and finally, the foam “insulating” layer fell off! The only other alternative was to sew the inner and outer tents together, so that is what we did. The result was a ridge design, the Keb, the first tent with connected inner and outer tents. It worked really well, and gave the company’s tent manufacturing a good start. Since then it has rolled on. We began offering other models; we began getting involved with outdoor courses, with expeditions, and with outdoor enthusiasts of all kinds. Renate and I agreed that our company should never take over our lives and influence our family in any negative way. Our children Rolf and Petra not only grew up living the outdoors life, but have also been – and continue to be – an intimate part of our family company. As a result, we have always made tents that not only do we use ourselves, but also tents of a quality that our best friends could use without any problem. We have been out so much, using our tents, that we have always worked continuously to make them better. Teaching courses has given us unique access to how new, inexperienced users handle the tents, so we’ve always kept a strong focus on tents that are easy to handle and that are comfortable and utterly reliable. And I think that our customers understand that we use the tents ourselves, and thus they trust us. After 35 years, I am still as excited as I ever have been about improving our tents. And I still cannot get enough of going into the wilderness and camping. I find it hard to say exactly why that is. Maybe it’s the sense of freedom I find out there, or the relaxation. Maybe it’s some primal longing to be intimately connected to the land. I do know that an outdoor life’s simplicity is what is most compelling: while it is – and always has been – a revelation to me to arrive at a beautiful place and camp, it has always been at least as important to leave that spot the next day looking as though I’d never been there. When I started going into the mountains in the 1950s, all of the available outdoor gear was heavy. Packs had heavy duty steel frames and rugged cotton canvas bags. Sleeping pads were reindeer skins – warm and comfortable, but also very heavy, especially in wet conditions, where they sucked up water like sponges. I joined the Swedish military’s Mountain Hunter unit in 1959, and we were issued the latest in outdoor equipment. Weight was still an issue, but the packs were of a more modern design, and the sleeping bags and reindeer skin pads were warm enough for the sometimes minus 40° C nights we en­countered. Shelter, more often than not, came from simple large triangles of heavy cotton that could be used individually or connected to make larger shelters. We trained to be self-sufficient behind enemy lines, so we carried everything we needed in our packs. Being based in Kiruna, above the Arctic circle, we needed to carry enough to keep us warm in very cold conditions, and with our weapons and other military gear, the pack weights were often brutally heavy. But despite the sometimes severe conditions, I quite enjoyed my time in Kiruna. I received an excellent education in real outdoor living. I learned to take care of myself in all situations, and to make sure I ate, even when all I wanted to do was sleep. Perhaps most importantly, I learned to take with me only exactly what I needed and nothing more, because with my weapon, ammunition and the like, the packs usually weighed between 35 and 40 kg/77 and 88 lbs. After leaving the military, I continued my outdoor adventures. I carried the same amount of personal gear, but the lack of a weapon and other gear meant a wonderful decrease in my pack weight and an equal or greater increase in my enjoyment! The gear was still heavy, but now my pack weighed “only” about 20 kg/44 lbs for a week-long summer hike. When the first real lightweight “revolution” dawned in the late 60s, things got even better. Cotton in tents and packs was supplanted by synthetics, and reindeer skin sleeping pads gave way to wonderfully light foam ones. In 1968, I did a two week trip through northern Sweden’s Sarek, Padjalenta, and Stora Sjöfallet National parks. Including tent, food, crampons, rope, camera, and everything else I needed for the entire trip, my starting pack weight was 18 kg/40 lbs. Such a liberatingly low weight was possible only because of the lighter weight materials. Today’s gear is lighter still – remarkably so: for a week-long, summer backpacking trip, my personal pack weight now is 15 to 17 kg/33 to 38 lbs, including food, tent, and all other equipment. In the winter, the weight is rarely more than 20 kg/44 lbs. But even as modern equipment has gotten significantly lighter, I have noticed that many peoples’ packs have actually gotten heavier. A few years ago, I wrote in one of our Hilleberg catalogs that the pack weight for a week-long backpacking trip didn’t need to exceed 17 kg/38 lbs. In response, I received a number of phone calls, decrying this claim. It was impossible, I was told, to carry less than 25 to 30 kg/55 to 66 pounds for such a trip. But after going through someone’s pack contents, I often received a thank you note because the caller realized that perhaps it wasn’t necessary to carry so much. Lightening ones pack affords not only more comfort and enjoyment on a backpacking or ski touring trip, but also provides a greater degree of safety: you can move more quickly, you are less tired at the end of the day, and so are less likely to get hurt. So why are packs prone to heaviness? The problem isn’t with those who need more gear – climbing or camera equipment, for example – or with those who choose a bit of luxury, such as gourmet food, wine, and the like. The problem is with those who believe they are bringing only the essentials, but still can’t get their packs under that 25 kg/55 lb weight. Inevitably, the culprits are unnecessary amounts of food and extra clothing, redundancies in equipment, or both. I believe that the over-abundance of excellent lightweight gear now available often represents too strong a temptation, so many travelers simply bring too much “stuff.” And bringing such extras can be a way to compensate for a lack – real or perceived – of experience and knowledge. At the same time, all the lightweight gear has also favored groups intent on saving weight, most notably adventure racers and those into “fastpacking” or “super ultralight backpacking.” Both are, I think, an example of the pendulum swinging from one extreme to another – from extremely heavy to extremely light. In both cases, however, comfort and safety are often under-prioritized, and this is usually not the best choice for most users. At Hilleberg, our approach is what we call Smartpacking: bring only the things necessary for the trip, and choose gear that is as light as possible WITHOUT compromising safety and the desired level of comfort. We have assembled pack lists on our web site, and these are divided into the necessities, the necessary extras, and the extras that are nice to have but not necessary. In addition, we give an approximate weight range for the items, from the lightest to the heaviest. This then allows one to choose precisely within his or her comfort zone, within a generous weight range. For example, if one chooses the lightest alternatives for only the absolute necessities, pack weight for a week-long trip in the summer might be only about 12 kg/27 lbs. Choosing the heaviest alternatives of everything on the list might take the weight to 40 kg/88 lbs. Such Smartpacking provides a way for backcountry travelers and adventurers to learn, and to gain confidence to push their limits, without having to take big risks. It encourages people to experiment with their gear while offering them discipline in their choices. And most importantly, it allows them to enjoy their time outdoors more! People sometimes ask me if we really need to make all the different tent models we do, and why our models look the way they do. It would simplify things, of course, if just one tent model – in just one color – could satisfy all users, but there are many who need or want different configurations. This is exactly why the Hilleberg models do look the way they do: to satisfy the varying needs of diverse adventurers. When we developed our first tent, the Keb, in the early 70s, we wanted to eliminate having to erect an inner tent and then cover it with a rain fly. Often with this separate pieces design, the inner tent would get wet before the waterproof outer, or fly, was in place. We solved the problem by connecting the two so that they could be erected simultaneously. That tent design was also shaped directly by our Scandinavian mountains, which are not particularly tall, but which are mostly above tree line and subject to constantly changing weather and high winds. So not only did the tent need to be easy to pitch, but it also had to be able to withstand bad weather and high winds. And, of course, it needed to be lightweight for easy carrying. These last elements – easy to pitch in all conditions, strength to handle all conditions in all seasons, and low weight – are still the foundation for all of our tents. In early days of the company, I did many winter trips with dog sleds, and it was the demands of such trips that led to the designing and building of our first tunnel tent, the Keron. The fact that it also worked equally well for summer use was an excellent bonus! Some users, however, expressed interest in a lighter version. So we developed the Nammatj, which is lighter and smaller than the Keron, but at the same time offers the same ease of handling and excellent stability in high winds. Not long afterwards, we realized that it would be a great option to have a larger vestibule for gear, food prep, and so on. This led to the development of the Keron GT, a model with one standard and one extended vestibule. It wasn’t long before the Nammatj had an extended vestibule version – the Nammatj GT – as well. With the Keron and Nammatj models – and their GT versions – we had a fine selection of all season tents geared for the toughest conditions. But customers, both old and new, began asking for an all season tent that was lighter in weight and perhaps a bit simpler, but still quite sturdy. These were users who did mostly summer trips, with a few winter outings once in a while. Starting from the Nammatj design and with a target weight of roughly 2 kg/4 lbs 6 oz – and with a great deal of work and testing – we developed the very successful Nallo. By the mid-1980s, Hilleberg was becoming known to adventurers other than hikers, climbers and mushers. Sweden’s very long coastline, with its thousands of islands, is a true El Dorado for kayakers, and many of these paddle tourers had started using Keron, Nammatj and even Nallo tents. But pitching tunnel tents on the rocky islands can sometimes be challenging. While there were already self-supporting dome tents on the market, they were of the separate piece design, where you had to pitch the inner tent, then cover it with a rain fly. And since their vestibules required pegs to work, pitching them was not much different from pitching a tunnel tent. We saw a need for a fully freestanding Hilleberg tent, one that required no pegs for set up and that had integrated vestibules – and of course that had linked inner and outer tents so that they pitched together. Since the tunnel tents are available in both “heavy duty” and “ultralight” versions, it was no surprise that many users wanted an “ultralight Staika,” a lighter, fully free standing, integrated vestibule dome tent built without compromising on the quality and reliability. This led to the Allak, which came out in 2008. In the early 1990s, we found that many of our customers were using the Nallo as a one person tent, so we saw a need for a true Hilleberg solo tent. Throughout my career, I have taught outdoor courses and led groups into the mountains, and I thought it would be quite nice to have my own tent, so there was a selfish motivation, as well. We decided that the tent’s weight should be 1.5kg/3 lbs 5 oz, and that the tent should still be all season strong and also meet all Hilleberg principles for quality and design. After a few years of many test trips, we were finally satisfied and introduced the Akto, which means “alone” in the Sami language. To say that the Akto was a success would be a massive understatement! It turned out that there were many who wanted a tent of their own, both for solo trips and on group outings. As with the Staika, the Akto inspired more user requests, this time for a fully free standing solo tent. This led to the development of both the Unna, and, most recently, the Soulo. So this is how we develop different models. While there are a number of tents that I have not mentioned, the background to every model is always the same: requests come from customers (or from our own trips), and these lead us to try and meet those demands as best as we can. I would not be surprised if this trend towards tents designed for specific user areas will increase. And the fact that many of our customers have many different models of Hilleberg tents in order to optimize their equipment for different trips is, of course, a welcome thing for an old tentmaker like me! A tarp is both simple and lightweight, and it offers a singularly “up close and personal” experience of your surroundings. 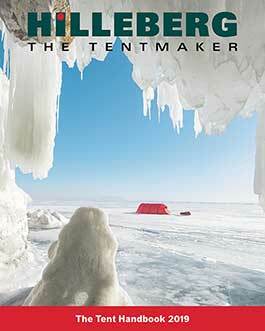 Hilleberg the Tentmaker is known for making tents for all conditions and all seasons. But before our company made tents, when I was working as a forester, I often used a simple piece of waterproof fabric as my only shelter. And before that, during my military service, I was issued a basic, triangular tarp which could be used individually or could be connected to other such pieces. While such “shelters” offer simple protection from bad weather — rain in particular — they are no substitute for a true tent, which provides a real refuge in truly inclement weather, and is essential for trips in exposed or above tree line terrain. At the same time, however, a tarp is both simple and lightweight, and it offers a singularly “up close and personal” ­experience of your surroundings. In addition, a well-designed tarp can be a very useful complement to a tent, and it makes a great outdoor gathering place for groups. On some trips, especially in the forest, I even prefer using a tarp instead of a tent as my primary shelter. Some years ago, I went on a canoe trip in Canada with some friends. Because of bears, we knew we would have to keep our sleeping and dining areas separate, so I brought a large tarp made from our Kerlon fabric. Some distance away from our tents we built a fire, where we cooked our meals, and right next to it we rigged the tarp. This outdoor “dining hall” was perfect for socializing, and it kept both us and our equipment well protected. It worked so well that we decided to add Tarps to our tent line, and they have proved very popular. And we ourselves often use tarps on our own trips. They are an outstanding choice for traveling very light, and, with their unrivalled viewing opportunities, they provide the ideal way to be truly “involved” in your surroundings. I have been experimenting with combining a tarp and one of our new Mesh Inner Tents, which keeps bugs away without changing the breezy comfort or panoramic viewing qualities of the tarp. When camping with a tarp, it’s a good idea to use some kind of sleeping bag cover. I use our Bivanorak, since it can accommodate both my sleeping bag and sleeping pad, and because I can use it to get out of the wind (or bad weather) during short breaks when I am hiking. I find the Bivanorak essential for winter tarp camping, both to keep moisture off my sleeping bag, and to keep snow from getting between my bag and pad. While I nearly always use a tent for winter trips, tarps do offer some unique opportunities. One of my favorites is called “nying” in Swedish. You make a fire and build it so it will burn all night long. Behind it, a short distance away, you rig your tarp, on a slant. Between the two and under the tarp, you lay out your pad and sleeping bag. The tarp acts as a kind of heat reflector, so you sleep warm and snug even on very cold nights. A tarp is also handy for sealing up cracks between snow blocks in a snow cave or as a protective roof over smaller snow holes. I also find that tarps are a wonderful accessory for tent camping. They are indispensable in bear country, where they provide both “kitchen” and “dining room” facilities away from your tent. They make delightful socializing spots on any group trip – rigged between two tents, they act as an open “living room” — and during breaks on a long day of hiking, they can be set up quickly to serve as wind or rain protection. Tarps are also a simple way to enlarge your vestibule space or to create a covered “patio” for your tent. And when rigged over your tent, they offer extra protection against UV rays, increasing your tent’s longevity. Of course, tarps do have their limitations, especially in windy conditions, and I definitively would not recommend them for overnighting above tree line or in other exposed areas. But even here, while a tarp isn’t the best choice, it is better than nothing. Once, when I was young, a Sami elder and I hiked into the mountains for a fishing trip on a remote lake. He didn’t think we’d need a tent as there was “protection” at the lake. This turned out to be a couple of pieces of plastic sheeting, and he explained that the “protection” came from lying in the plastic, grabbing one edge, and rolling into it, like a burrito. While waterproof and warm, this “system” left quite a bit to be desired in the condensation department. But it was indeed better than nothing! This margin of safety is effectively the “insurance” we build into our tents against both unforeseen occurrences and user mistakes. In part, this in is inherent in all our tents. I recently read a review of our Red Label Kaitum which praised the strength of both the construction and the Kerlon 1200 outer tent fabric but was amazed that we didn’t call it an “expedition” tent. To us, an “expedition” is an adventure that is long, often in remote areas, and in challenging terrain and conditions, and despite the Kaitum’s impressive strength and durability, it does not have the qualifications we at Hilleberg believe are required for a true “expedition” tent. Thinking about this, I realized it would be good to write about what lies behind how we develop our tents. It breaks down to two fundamental concepts: how we look at a tent’s performance, and the tent’s margin of safety. We only compare a tent’s performance to our other tents: we don’t ever compare to any other brand. So while a Kaitum is, for us, not an expedition tent, a Keron is. Indeed, our Black Label tents are all built with expeditions in mind: they are our strongest, most adaptable and most comfortable tents, and they will perform well in conditions ranging from the harshest to the mildest. Put another way, Black Label tents offer the greatest “margin of safety” for the user, the second component of our core thinking. This margin of safety is effectively the “insurance” we build into our tents against both unforeseen occurrences and user mistakes. In part, this in is inherent in all our tents. All have double wall construction, putting two layers between you and the elements. All have their poles on the outer tent, so that if a pole breaks, it won’t puncture the tent itself. And all of our outer tent fabrics have a very high tear strength, which provides greater longevity, and also means that if you do get a hole in your outer tent, it is far less likely to turn into a trip-ending situation. In short, the construction of every Hilleberg tent is engineered to keep you safer from the elements. This safety margin is also the basis for our Label system. Black and Red Label tents are built for all-season use, while Yellow Label models are geared for snow-free, warmer weather use. Black Label tents have the strongest materials, and offer the greatest margin of safety, while Yellow Label models have the lightest materials (and the least safety margin), and Red Label tents fall between the two. Think of the margin of safety as the “padding” that you the user feel comfortable with in case things go badly. If you think you might get stuck in a snowstorm on many of your trips, or if you often travel in exposed terrain, more margin is a good idea; if you only go out in the summer, and always camp in the forest, perhaps you’re fine with less margin. Black Label tents have the greatest safety margin for all users, from the least experienced to the most. While they are the easiest to use for less experienced users, they are also ideal for – and often chosen by – the most experienced users: polar adventurers have nearly universally chosen the Keron models for over 30 years precisely because these tents offer the degree of security that allows their expeditions to achieve their goals. Red Label tents offer a somewhat smaller margin of safety. We have seen many expeditions and people on long-term trips have great success with Red Label tents, but they have made a conscious decision to give up some margin of safety in exchange for lighter weight. That said, since we don’t compare except within our whole range, if someone tells us he or she wants to bike around the world, trek the Himalayas, or tackle remote, high alpine mountains, we will most often suggest Black Label over Red Label models. Yellow Label models, often referred to as our 3-season tents, are built for snow-free use and to be very light, but they provide the smallest safety margin. In our own testing, we have seen Yellow Label models stand up to serious conditions, and we know customers who use Yellow Label tents for things we certainly do not recommend them for. But such users are comfortable with that small margin of safety, they understand completely what they are giving up, and they are prepared for the consequences. However, when any customer asks, we advise them to go “up” a Label if they have any doubts about how much safety margin they need. My daughter Petra sums up the Hilleberg company vision perfectly: “We are always finding new ways to make our tents better, and new ways to make better tents.” Our two core concepts – only comparing Hilleberg tents with other Hilleberg tents and focusing on the tents’ margin of safety – are the foundation behind that vision. Since we started Hilleberg, we have always worked hard to make the highest quality tents, and to make them so they will last a long time. Since we started Hilleberg, we have always worked hard to make the highest quality tents, and to make them so they will last a long time. It’s part of who we have always been, and it is a big part of our sustainability plan. We want to make tents that the original owners can use, and that they can pass down to their children to use. That said, as with all things built to last, from cars to airplanes to appliances to manufacturing machinery, it’s impossible to have a tent last a long time without some maintenance and repairs. Parts do “wear out,” so you might need to replace the zippers at some point, or the elastic webbing that connects the inner and outer tents. After 10 years, the tent might need a new floor. We know this, and we build it into our company: having full repair capability is part of our “responsibility” ethos, and we have repair personnel in both our Swedish and US offices. We also work closely with repair companies in Europe, to the point of training them, so that they can produce the quality repairs that we demand. We can repair nearly anything, and while some things are more difficult than others, we can make the tent fully functional again. A hole in the pole sleeve is a repair you might not notice. On the other hand, repairing where a bear clawed the tent – something we have dealt with a surprising number of times – will be noticeable, but the repaired tent will be fully functional. Our repair staff are justifiably proud of their skill, and they enjoy getting a favorite, much-used tent from a customer and repairing it so the customer can keep using it for years to come. The most common repairs we do are to floors and zippers. Floors, of course, take a beating, so at some point, they will likely need some attention, up to and including replacement. And while using a footprint will make the floor last longer, it doesn’t protect the inside of the floor. All of our tents are designed so that doing a complete floor change is a straightforward operation, and it is one that we have lots of experience with. Zippers, too, are something that get lots of wear. We have yet to find a zipper, from any supplier, that can stand up well to sand and grit. Here especially, maintenance is crucial. Keep the zippers clean, and keep them out of the dirt. We do know customers with 20- or 30-year-old tents that work just fine, with no repairs, and taking good care of your tent is the key. A very normal customer group for us does at least one or two long trips in both summer and winter, and goes out fairly often on weekends. In our experience, we get very few repair requests from this group since they do the best maintenance. Making sure your tent is dry before you store it is a simple thing that makes a big difference. Avoiding excess exposure to the UV rays is another. Unfortunately, lightweight fabrics are more susceptible to the effects of UV. If you’re going to be pitching your tent frequently in high UV conditions – glaciers, high altitude peaks, deserts and the like – consider bringing a tarp to protect your tent. If you do longer trips, such as months-long treks or around the world travel, be prepared. I am always surprised at those who go on long bike trips and take a repair kit for their bike, yet somehow expect that their tent will never need maintenance or repair. Perhaps the most important thing is to take care of your zippers. We recommend that you use, without modification, the zipper pulls that we put on the sliders. If you add a piece of cord to the zipper pulls, or completely replace them with cord, that will put more strain on the slider, and your zipper can wear faster. Keeping the zippers free of sand and grit is crucial. One of our ambassadors, Freya Hoffmeister, has paddled around Australia, New Zealand’s South Island, and South America, and has spent a great deal of time in sandy areas. She always opens her tent’s doors from the top, to keep the sliders from ever dragging in the dirt. And especially on long trips, and most especially in sandy conditions, brushing your zippers regularly is an excellent practice. If your zippers do start to fail, you can do some field repairs. At the first sign of trouble, squeeze the slider together. If the problem gets worse, you can change the sliders. Unfortunately, there is no way to repair the worn teeth in the coil, so at some point, you will have to have the zipper replaced. Having the capability to do repairs is very important to us, and not just because we call ourselves “the tentmaker”! For us, it’s about value: we want to make sure our customers have access to the highest quality repairs if they need them. But interestingly, the number of repairs in all our repair facilities compared to all the tents we’ve sold over the years are very few.